I’ve just driven home from the theatre and sat down to write this immediately – that’s how good this show is. Saying it’s spectacular doesn’t really do it justice. From the moment the first actor appeared from the darkness on stage until the big finale, I was captivated. It’s mesmerising. This was my first time seeing War Horse* and now I understand the hype behind it. It deserves the awards, it deserves the praise and this is one of very few shows I’d probably go and see again. 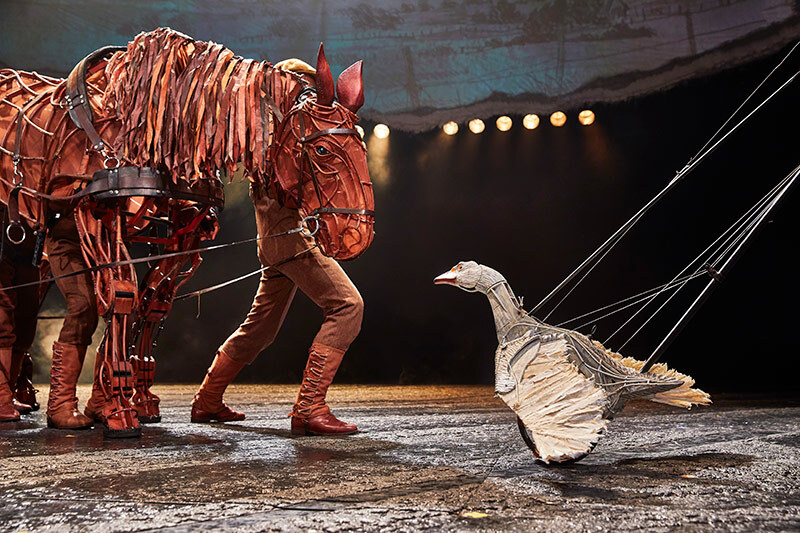 Nick Stafford’s adaptation of Michael Morpurgo’s story, about a young boy named Albert and his horse called Joey, is a stunning piece of theatre. Michael is one of my favourite children’s authors, I loved his books as a child and still do, he is a magical storyteller. The story follows the courage, loyalty and friendship between the boy and his horse during the First World War. I’m not going to go into further details as I personally think it would ruin the story for you. No one told me about the story and I am so glad I went in not knowing any of the plot. All I will say is take some tissues with you as it’s very emotive and is set in a very tragic period of our history. 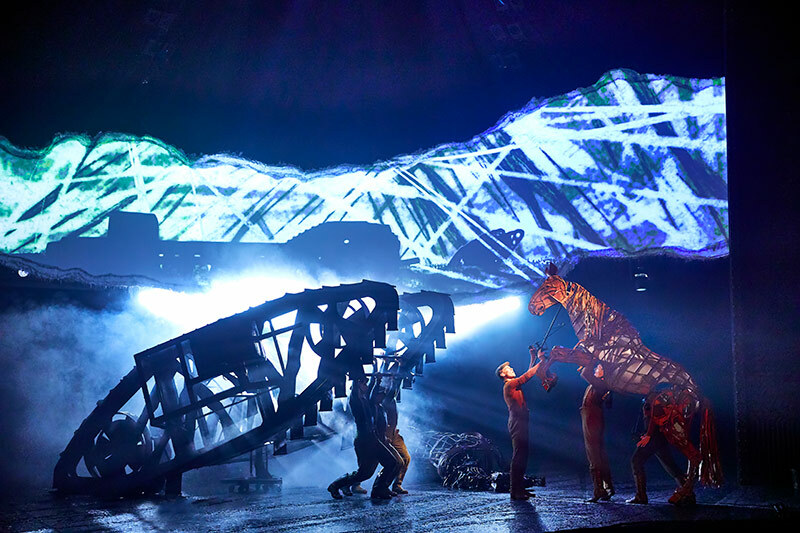 War Horse is now in it’s tenth year which coincides with the Centenary commemorations of the end of the First World War. There’s some very poignant scenes, beautifully executed, that make you think about all the sacrifices and hardship men and women went through to bring us peace. The ground-breaking puppetry work is by South Africa’s Handspring Puppet Company, and it’s like no puppet I’ve ever seen before. The horses are huge structures which take two to three people to bring them to life. The actors do an incredible job of bringing all the mannerisms of a real horse, think twitching tails, alert ears and stomping hooves, to the inanimate puppet. After a while you forget there are people inside the horse bringing it to life – it’s pretty impressive! There’s also several birds and a funny goose that are also puppets. The bird puppets bring tension and humour to key moments of the show – they way they move is so similar to the real way birds act. My description doesn’t really do them justice, to call them puppets is not good enough. They are striking bits of art which are then brought to life by teams of insanely talented actors. I just went to write a bit about who I thought stood out from the cast and I genuinely couldn’t pick one person. This never happens for me, I am always so critical. They all worked so well as a team and shined in their individual roles. It’s extremely well cast and there’s a beautiful balance to the show. The music is dramatic, influenced by the charming folk songs of Devon. It gives the show a familiar warmth and sorrow that only that type of music can create. It’s not a musical but the music works flawlessly to transition between scenes. This is also reflected on stage by seamless set changes. War Horse has the best scene transitions I have ever seen. It’s so clever. Actors are used as pieces of set and some stay on stage in various forms helping to transition the scene while developing the story at the same time. It makes the production seem an awful lot bigger than it actually is. The whole production is very aware of the space they are working in and use every part to their advantage. I’ve heard in other locations they have a slightly different stage set up but from tonight you’d have never know – the actors are consummate professionals. Clever lighting, smoke and the torn paper video screen that sits above the stage, like a scrap ripped out of a book, are the finishing touches that bring the simple stage set together. As you can tell I absolutely loved this show. It balanced humour, sorrow, courage, loyalty, history and love and neatly packaged it into this emotive and cleverly crafted story. I’ve tried not to reveal too much intentionally because if you haven’t seen War Horse I would not want to ruin it for you. If there’s still tickets available (the last tour was sold out!) 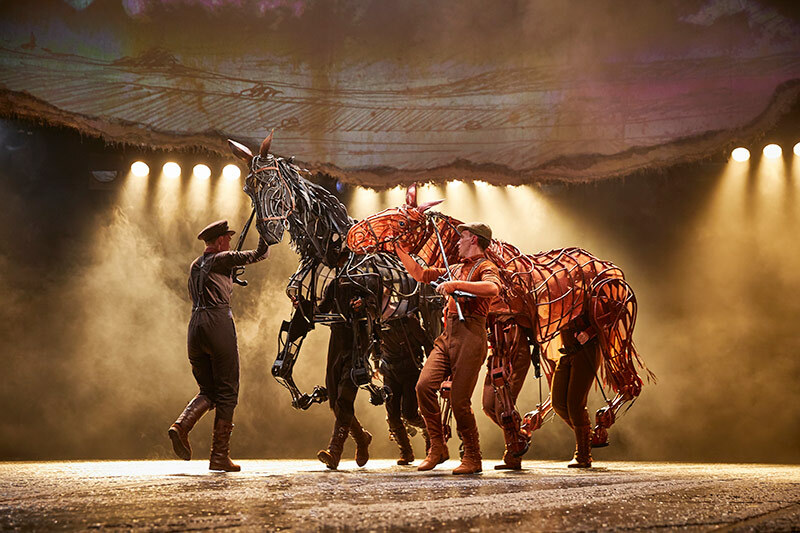 War Horse is in Southampton until 9 June, 2018. Get a gallop on and go see this incredible show! 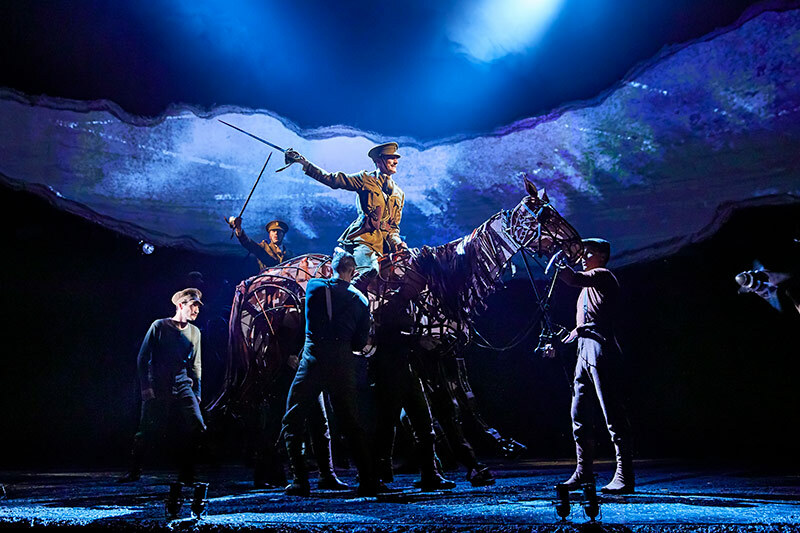 Michael Ockwell, Mayflower Theatre’s Chief Executive, said: “I am thrilled to be bringing War Horse back to Southampton after its sell out run in 2014. It is rightly appropriate that the show runs here bookending the centenary commemorations of the end of the First World War. The show will amaze, move and educate a new generation once again”. I agree with Michael, this show will amaze, move and educate – we are so lucky to have such an amazing theatre that can hold these kinds of shows in Southampton. We’re spoilt and we don’t know it. Mayflower Theatre is about to ‘go dark’, that’s theatre speak for closing the doors to the public, for a few months while it’s refurbished and new seating is put in. I can’t wait to see what it will look like and get my bottom in a comfy seat when the theatre reopens later this year. Find out more about the refurbishment and upcoming shows by visiting the Mayflower Theatre website. *PR experience – Complimentary tickets for review but, as always, all opinions are my own otherwise what’s the point? !